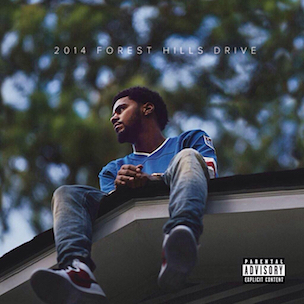 J. Cole has the #1 album in the country and the biggest first-week sales numbers of any Hip Hop artist in 2014. With just over 350,000 albums sold in its first week, 2014 Forest Hills Drive knocked Taylor Swift’s big seller down to #2 for only the second time since her album was released. The news comes just a week after Wu-Tang Clan failed to break into the Top 25—they’re at #120 this week—and Cole’s numbers are more than double the sales projections for Nicki Minaj’s new album, which will get its first sales report next week. Meanwhile, Eminem’s compilation album Shady XV dropped out of the Top 20 as did Rick Ross’ Hood Billionaire following first-week debuts in the Top 10. In addition to a handful of R&B releases including K. Michelle’s new album, PRhyme and E-40 also counted their new projects in the highest-selling Hip Hop albums of the week. Ghostface Killah also saw his latest album, 36 Seasons, chart at #95. Outpacing already lofty first-week sales projections of up to 270,000 copies, J. Cole sold a total of 353,538 albums as of Sunday (December 14). The release quickly jumped to the #1 spot in iTunes and despite a quiet promo lead-up was able to outsell the next biggest seller by more than 75,000 units. In addition to the album sales, 2014 Forrest Hills Drive sold 103,676 single songs and was streamed 10,984,761 times, bringing its total Billboard activity number to 371,228. This third album from J. Cole is his second to debut at #1 and third to reach the milestone after Born Sinner climbed up to the top spot in its third week in stores last year. The latest numbers also highlight the biggest first-week sales numbers of Cole’s career as well as the best first-week performance from any Hip Hop artist this year, eclipsing Rick Ross’ outing with Mastermind in March. With some first-week gossip controversy with Lil Kim keeping her name in the headlines, R&B singer K. Michelle outsold One Direction’s album to take the #6 spot in its first week on the shelves. K. Michelle’s Anybody Wanna Buy A Heart? sold a total of 84,117 units and was streamed more than 1,578,000 times. Lower down the list, a trio of veteran artists arrived on the charts with a pair of albums released in the past week. The joint project between Slaughterhouse rapper Royce Da 5’9 and iconic producer DJ Premier reached #59 with a total of 13,547 albums sold. Just two spots down, the first of a trio of albums from E-40, Sharp On All Corners, debuted with nearly 12,000 units sold and more than half a million streams. Note: The figures below represent this week’s “total activity,” an intersection of album sales, single sales, and streams. A pure album sales figure is available in parenthesis and information about each album’s streaming count is available in brackets.